Are you as excited as I am for fall to be here? Cooler weather, lots of outdoor play time, football, and of course, Halloween. We have already begun our search for costumes this year. What can I say? It’s an exciting season for us. 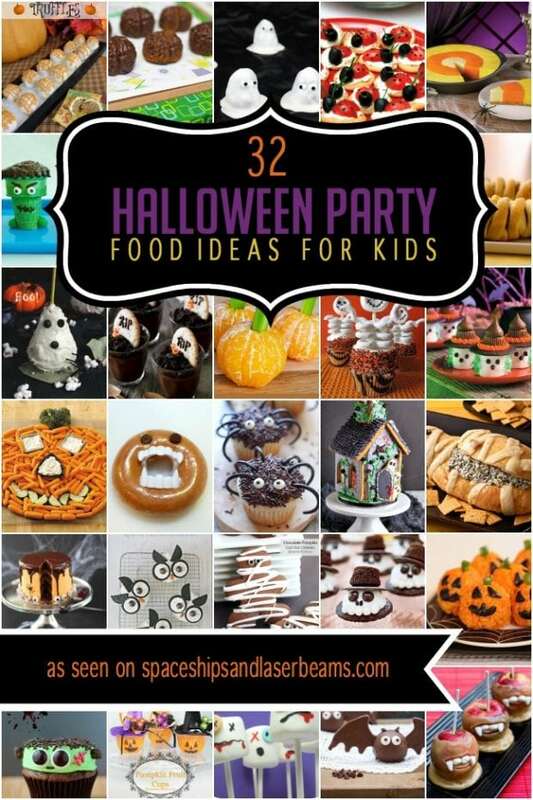 Even though the temps are still very warm, there’s nothing like planning a fun Halloween Party full of great kids’ party food ideas to get you in the spirit. These treat ideas ought to do it: green Frankenstein Krispie Treats, color-changing Witches Brew, Monster Eye Cookies, Spooky Shakes (with bat eyes! ), Gingerbread Vampires, Monster (pop)Corn, Personal Halloween Pizza and Monsters-on-a-Stick. There are also some tips for a DIY candy dessert table to display all of these great treats. It’s spooktacular! Let your kids enjoy this Jack-O-Lantern Pizza for a fun and spooky Halloween treat. These Halloween Cake Pops: Frankenstein are perfect for your next Halloween party. You’ve got to make these Easy Halloween Spider Cookies. These green guys are sure to be a delight at your Halloween party! They could also be a fun activity for a kid’s party. Simply create and cut out the base of the treats and let the kids decorate their monsters however they want! By taking some of your favorite shake or sundae additions and giving them a creepy name, you’ve got the perfect Halloween dessert! From werewolf toes to bet eyes, your guests will have a fun time creating their own creepy desserts. Label each one with it’s own creepy name to make sure your guests call it by the right name. These gingerbread cookies definitely have a bite to them. By giving these cookies some fangs, they’re dressed up and ready for Halloween instead of Christmas. This is the perfect way to break out your favorite gingerbread recipe more than once a year! While the idea of a color-changing drink might seem daunting, don’t let this festive drink scare you away! It’s as simple as freezing ice cubes in different shapes and colors, they all melt together in the drink, giving it the color changing effect. Everyone will be amazed at their witch’s brew! This Halloween treat couldn’t be anymore simple! With some mini chocolate sandwich cookies and chocolate candies, this eye-popping treat comes together in no time at all. Guests are sure to gobble these up throughout the night. Nothing is better than candy on Halloween, right? Let your guests fill up their treat bags with this spooky candy buffet! Deck out your buffet with creepy decorations like spider webs, candelabras, or skeletons. Easy and festive! This colorful corn would be a fun addition to a dessert table! Make it more eye-popping by adding in some candy eyes. Pick your favorite colors or go for something more festive such as orange or purple. This savory treat is definitely one to try. Set out the ingredients and let everyone create their very own pumpkin or spider web pizzas! Pepperonis make perfect faces for the pumpkins, while olives make for a convincing creepy-crawly. See who can make the most creative pizza! What’s Halloween without the monsters? These little monsters will make your Halloween dessert table complete. A sweet and not-too-scary treat! Previous Post: « Wild West Cowboy Birthday Party!